Where I heard about it: Theatrical makeup has always sparked my interest. What it basically is, is makeup used for stage (television) & performing arts. The foundations are highly pigmented for full coverage & typically waterproof or long lasting so the makeup can withstand bright camera lights. I first learned about “theatrical” or “special effects” products when one day I was very curious to know what foundation the girls from E! The Girls Next Door (Kendra Wilkinson, Holly Madison & Bridget Marquardt) were wearing. In 2005-06, it was my favorite show and I loved to see the girls transform once their makeup artists did their makeup. So, I searched online to see if I could find any answers and came across an article by Holly Madison where she states that she wears Cinema Secrets foundation. Shortly after, one of my myspace friends (Jody MonroeMisfit) the time was posting gorgeous FOTD’s and she was wearing Cinema Secrets as well. 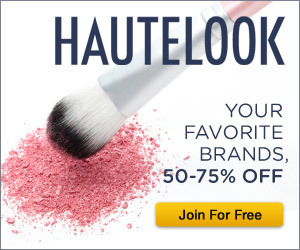 I started doing some research and learned about all of the different brands such as RCMA, Graftobian, Ben Nye, Cinema Secrets, Kryolan, Mehron, Etc. I placed a couple of orders for some Ben Nye products & a Cinema Secrets foundation palette. When I tested it out, I loved it.. but none of the colors matched my skin tone. I ended up throwing it in my drawer and never placing another order. As much as I wanted to try so many products.. it was too difficult to find my right shade on the computer screen. So I gave up..
Over the past years I’ve learned & read a lot more about the products. Still, I don’t like to purchase foundations online if I haven’t seen them in person. It wasn’t till a few months ago when I watched Wayne Goss’ Graftobian Foundation Review on youtube. He talked about how much he liked it and it made me wanna give it another shot. So I started to read several reviews to pinpoint what my shade may be. Below is what I found. Color matches for NC30-NC40. This is based on the several reviews I have read. 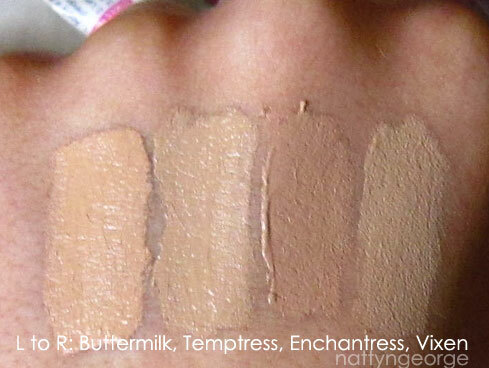 There may be other skin tones that can be matched to these shades. This information is only based on what I have found. All foundations are categorized by “warm”, “neutral” and “cool”. 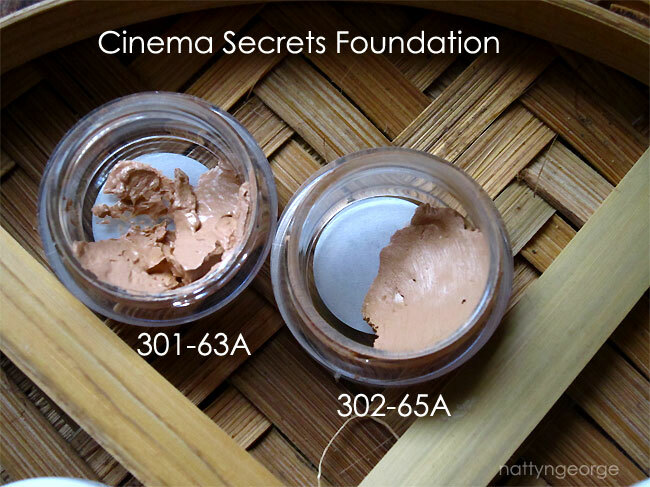 View their foundation comparison chart here (includes cinema secrets). Foundation palettes are available, which contain 5 shades categorized by undertones. Warm Palette #1 contains Graceful Swan, Ingenue, Vixen, Temptress & Enchantress. It is best suited for MAC NC15-NC35. 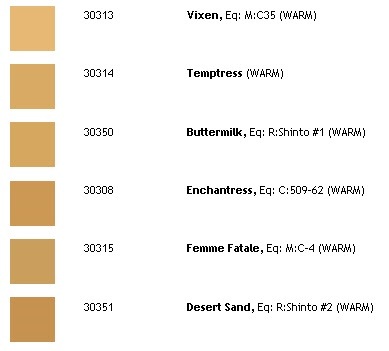 Warm Palette #2 contains Buttermilk, Desert Sand, Golden Sunset, Deep Xanthe & Mid. Marigold. It is best suited for MAC NC30-NC50+. Warm Palette #3 contains Femme Fetale, Winter Wheat, Ginger, Burnt Amber & Sienna. It is best suited for NC40-NC50+. If I was to purchase a palette.. I’d get both #1 & #2. #1 has lighter shades that would be good concealers & there is my NC30-35 shade and #2 has my NC30-35 shade as well as NC40 when I’m more tanned & darker shades I can use to contour. 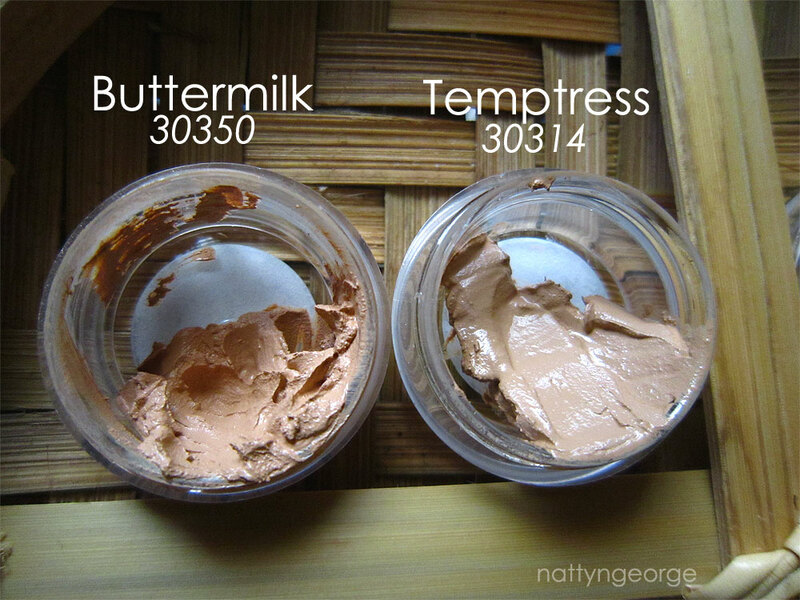 I ended up purchasing samples of Buttermilk, Temptress, Enchantress & Vixen. Review: I really like the foundation. It has a very creamy texture and you only need a very small amount to cover your face. I’ve applied this in two different ways. By a sponge and by my MAC 131 brush. The sponge provided a little heavier coverage than the brush. I like applying it with a sponge and then buffing it in my face afterward with the brush (dry). It covers every blemish on my face and it doesn’t at all look cakey. It actually looks very natural. Almost like my own skin.. but better 🙂 I definitely recommend a setting powder.. as creme formulas tend to transfer easily. The staying power is pretty good. If I applied my makeup in the morning.. it still looks good by the evening. But, by the end of the night.. a lot of it vanished off my face. What I’ve mostly been doing is apply my regular foundation and swipe my 131 brush across some product and buff it in areas of my face for extra coverage that my regular foundation may not have covered. As for the colors.. I wish they were more yellow. Buttermilk seemed the yellowest out of the four.. but it is a little light. Vixen seemed to be the 2nd best.. but I found it to be more neutral/beige than yellow. Vixen would give my skin a little bit of a gray cast.. which is usually what happens when a foundation is too beige & not yellow enough. Temptress is almost identical. Because they are slightly neutral, I’ve been mostly using them in conjunction with my regular foundation. Enchantress is a little too red toned for me. Overall, I will most likely be ordering a full size of Buttermilk. Yes, it is the lightest of them all 😦 But it matches my undertone the best. I’ll be able to use it when I’m not as tan. I actually swatched MAC Pro Longwear Foundation in NC35 on my hand next to Buttermilk and they were almost (90%) identical in color. 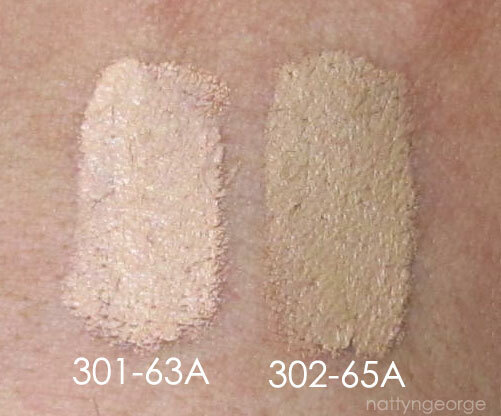 300 Series foundations are for many Asian and Caucasian skin tones with yellow base and undertones. They also have foundation palettes with 5 shades. Palette #3 is best suited for yellow/olive undertones & has 3 of the 4 shades from the 300 series. 201-67A is a light warm olive gold – void of any red, ideal for many Asian, Hispanic, and African-American skin tones & 202-20 is a medium dark olive gold, good for a wide range of darker skin tones with no red undertones. If you are lighter skinned, these can be used as contours. I ended up purchasing samples of #301 & #302.
Review: I liked Cinema Secrets just as much as Graftobian. I honestly didn’t see much of a difference between the two in terms of finish or wear. 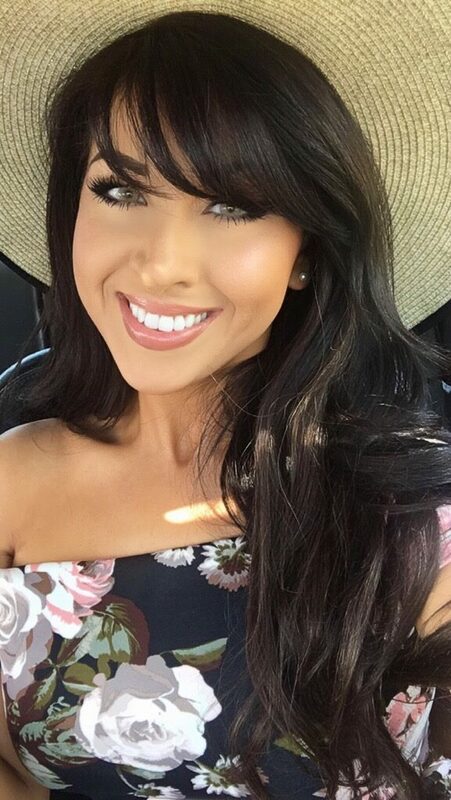 301 was definitely a little light.. but its been working perfect as a concealer to bright up under my eyes.. and as a foundation for when my self tan is pretty much gone. 302 seemed to match me perfectly & is a great match for NC30-NC35. It doesn’t seem to turn me gray like a couple of the other shades. I will most likely be ordering full sizes of both colors. Great Post! My blog has a great selection. wow. this is really interesting. i would have never known about these type of foundations. I do need alot of coverage because I use multiple concealers and mac studio sculpt on areas of my face! I have red veins so it's difficult to wear blush unless they're covered. Thanks so much for this!! Great review! Really in depth. I really like Graftobian and have been using it for years for video shoots and on myself at times…a little really goes a long way and I like how you can mix them to get the right shade. I now have these foundations on my wishlist!! and it looks so beautiful on you too! Thanks for this extremely helpful review. I've been wanting to try Graftobian for a while now and now I have a clearer picture of what shades to get. This was an exhaustive and superb review. I am a makeup junkie and currently am satisfied with my Mac pro long wear and MUFE HD but I have ordered both Cinema Secrets and Graftobian based on your reviews. Thanks for taking the time and for your patience in doing such a thorough review. Do both the Graftobian and Cinema Secrets foundations work well with flash photography? (where the flash/light may be bouncing off of the face resulting in a white cast) -By the way, you look great in that photo! is there a shade for the cinema secrets foundationi for nc20? You should really try Joe Blasco and RCMA. 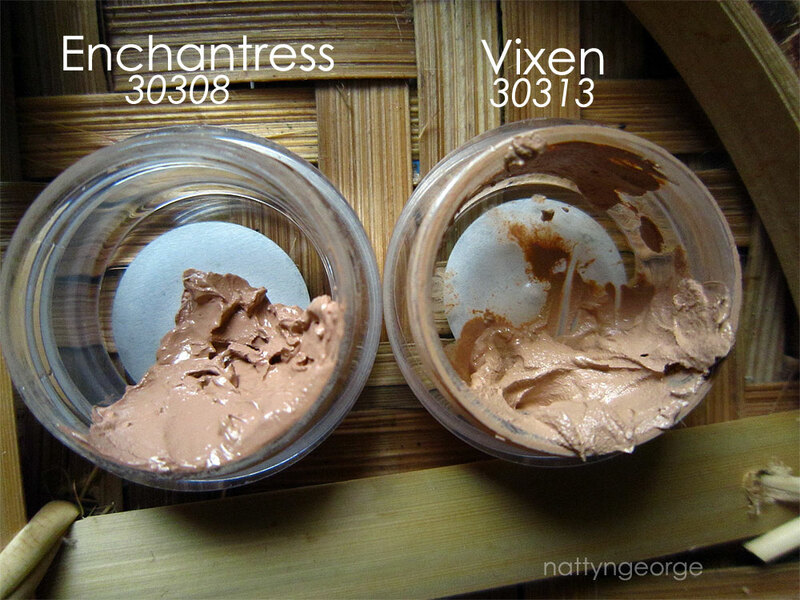 They're both much more pigmented than a lot of other brands and look really natural. You need a powder to set and they're pretty thick so some lotion or foundation thinner is what I recommend. I recommend RCMA's colorless powder and RCMA's foundation thinner. RCMA also has quads and palettes and the like. Both can be found on their respective websites and on camera ready cosmetics(you can order samples of RCMA and Joe Blasco). If you get Joe Blasco ( ([335oz/9.5g] ingredients: Petrolatum, dioctyl adipate, octyl stearate, carnauba wax, octyl palmitate, iron oxides, titanium dioxide, beeswax, corn oil, talc, butyl paraben, polyethylene glycol, tocopheryl acetate, ascorbyl palmitate, citric acid, ascorbic acid. May contain ultramarine blue, chromium hydroxide green), I recommend that you get from the Olive Beige line(#1 is light, #2 is medium, #3 is dark). It's yellow, but not green enough to be olive and has just a hint of it. You may be able to use the Warm Olive series(#1 is extra light, #2 is light, #3 is medium, #4 is dark), which used to be called their oriental line, and has stronger yellow and green undertones than Olive Beige. The Golden Olive series(#1 is light, #2 is medium, #3 is dark) may suit you a lot better. It has really yellow ochre-undertones it really suits anyone who's honey-colored; like light-skinned African Americans, Hiispanics/ Latina(/o)s/ Chicana(/o)s, etc.). The Golden Tan(#1 light tan, #2 is medium tan, #3 is dark tan) series is for people who are tanned, with a greenish golden tan. If you get tanned or want to simulate one, you may find that the Tan series is best. Natural Tan is a yellow-brown medium tan. Summertone is a yellow-brown light tan. Sun Tan is a red-brown dark tan. RCMA ( [1 oz.] IPM, Castor Oil, Carnauba, Candililla, Ozokerite, Titanium Dioxide, Iron Oxides, propyl Paraben, BHT. May Contain: D&C Red #6, D&C Red #7, D&C Red #27, Cos.Green, Cos. Blue) may suit you also. Shinto(very simlar to Joe Blasco Warm Olive) was created for Asians and has very green-yellow undertones(1 is light, 2 is medium, 3 is deep, 4 is dark[deeper], 5-10 were created for men; 5 is a light yellow tan, 6 is medium yellow tan, 7 is a deep yellow tan, 8 is a dark(deeper) yellow tan.) KO(#1 is fair, #2 is light, #3 is medium, #4 is deep, 5-8 was made for men; #5 is men light, #6 is men medium, #7 is men deep, #8 is men darkest) will probably suit you better as it is very yellow, but not really that green, and it is actually very versatile and can suit many different people. The KT(also known as Tan) series may suit you also as it is mostly yellow tan.#1 is a light yellow tan, #2 is a yellow tan, #3 is a dark yellow tan # 34 is a mix of 3 and 4 #4 is a dark tan. KL may also suit you and is a line that was originally intended for Latinas/Hispanics/Chicanas and it is a mix of Shinto and Tan. Also, RCMA considers warm to be red and cool to be yellow(just like MAC). #1 is pale, #2 is light, #3 is medium, #4 is light warm, #5 is medium light warm, #6 is deep warm, #7is deeper warm, #8 is darkest. You should really consider pro brands like these and others. They don't invest in fancy packaging and precise how-to guides, but do give phenomenal results. They also give room to experiment and you can use one thing a variety of ways. What is the finish on these? Are they both natural or demi matte? Thanks!